Lightweight design and Cortech’s history of performance apparel combine to make the Blitz 2.1 Snowcross Jacket. A combination of 300 denier Carbolex® and 840 denier Oxford materials make for a light but durable outer shell while a 100% waterproof and breathable membrane guards against the elements. 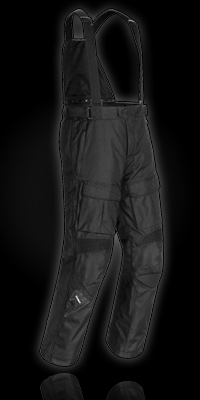 Pre-curved legs with elasticized stretch panels at waistband and knees provide extra comfort while side climate control vents help to regulate body temperature. • 300 denier Carbolex Lite outer shell. • 840 denier Oxford overlay in the knee, seat and inside calf. • 100% waterproof and breathable membrane. • Pre-Curved legs with elasticized stretch panels at waistband and knees. • Two front hand pockets and two cargo pockets. • Full side leg zip for easy wearing. • Snow cuff at the ankle. • Side climate control vents. • Fixed liner features warming 180g polyfill insulation. • Two adjustable waist belts with TPR pulls and removable suspenders help to easily fine-tune the fit. • Cortech’s® signature reflective rear triangle on calves.